We have a small private lot next to the building. There is also street parking in front. We are available for catering. Whether you are a small or large group, we have a room for you! 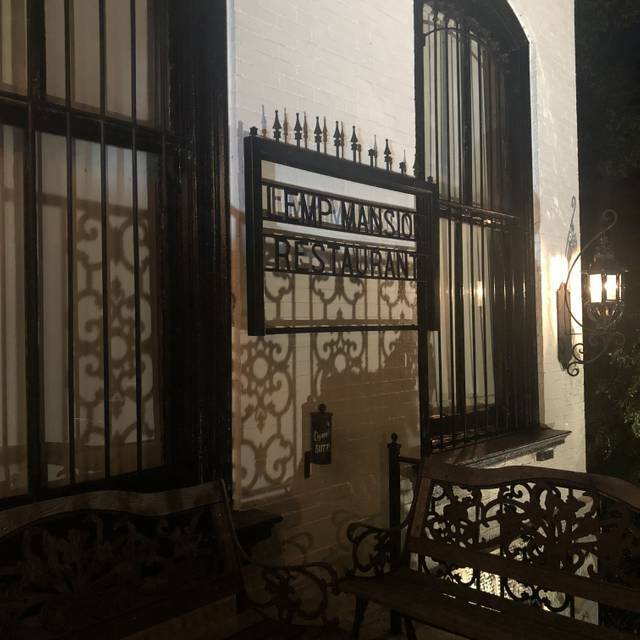 The Lemp Mansion has private rooms for 20 to 50. We also have banquet spaces available from 100 to 300. Looking for a unique place to dine! 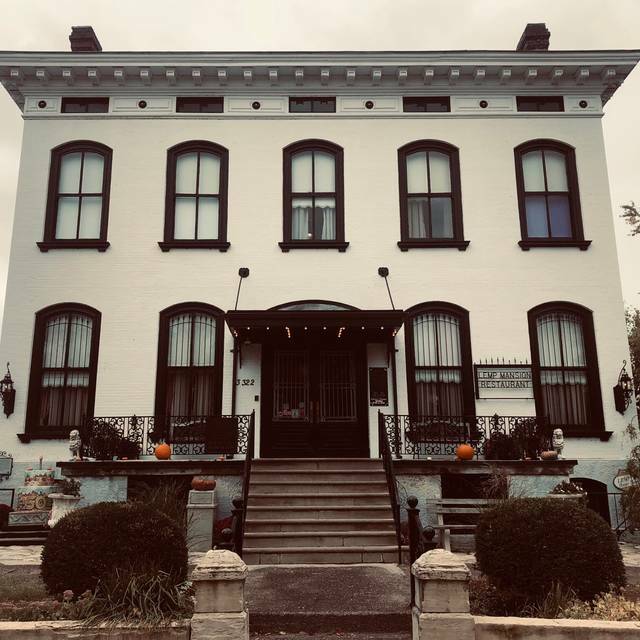 Come enjoy the haunted historic Lemp Mansion. We offer a variety of dishes, from Beef Wellington to Eggplant Parmesan. Make sure to save room for a delicious Bananas Foster or Cherries Jubilee, our flaming desserts prepared table-side. On Sundays, we serve Family-Style Chicken Dinner, all you care to eat! After lunch or dinner take a wander around the main floor. There are many beautiful aspects to see, from the hand painted ceiling in the Parlor to the original vault doors leading into our museum & gift shop. 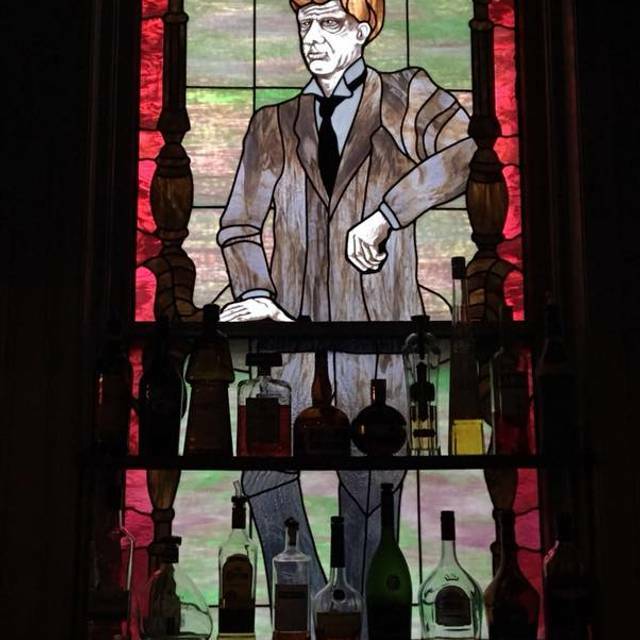 The Lemp mansion was originally the home of the biggest beer barons of their time. 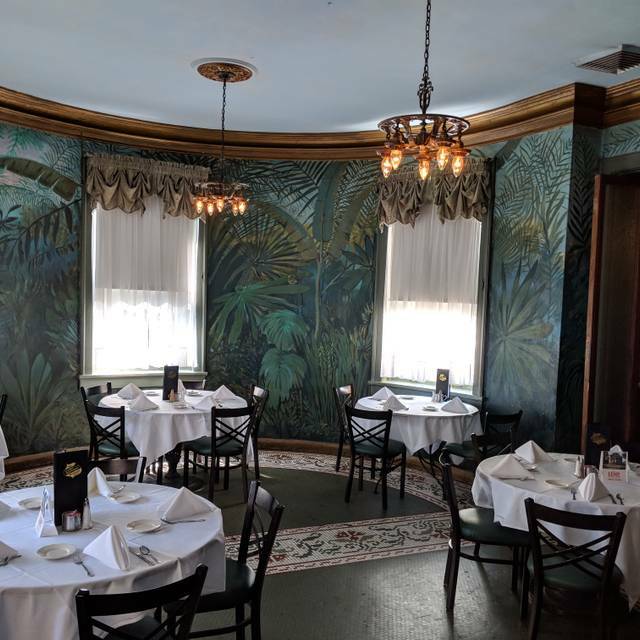 The Lemp Mansion Restaurant has been open for 41 years! Come see why we are "famous from ghost to ghost!" The food was outstanding! It did take a really long time to get our bill, but to be fair there was a large table that all requested separate checks. Maybe someone besides the server could help with delivering the bill in those situations. Regardless, we had a wonderful time and I would always recommend. Went there for Easter Dinner, so I knew that it was going to be a bit more expensive than their other Sundays. Food was very good but certainly not worth the price. There was nothing that wasn’t what you could have gotten cheaper somewhere else. First time visiting the Lemp Mansion on Sunday. The food and service was excellent, we will be back. I recommend this for anyone looking for a great home cooked meal. We were here for the all-you-can-eat Sunday fried chicken dinner served family style. The food was terrific and there were enough options to satisfy everyone. Our group consisted of children, teens, and adults and nobody went home hungry. Our servers were attentive with drink refills. We will be back. I would recommend going for the ambiance and a drink at the bar but the food was average and the service was mediocre. Our waiter was outstanding and the other waiter on duty stopped to tell us a ghost story. You cannot beat the service there. Food was great. And the house is gorgeous inside. Loved it! Truly enjoyed our meal! Food delicious. Wait staff attentive. Will certainly be back. Our dinner at the Lemp Mansion was fabulous as always. We went there to celebrate my mother's birthday. The staff was so nice and the Sunday Dinner was amazing!! The best fried chicken! Fabulous food! The waiter was a little snarky, probably because he thought that he wasn't going to get a good tip waiting on three women! Beautifully decorated! Loved the museum, too. Excellent food, service, and fun for the whole family. I will be going again. I love the Lemp Mansion and work who are working there. Hope see you guys again really soon. Every course was delicious. The service was relaxed and efficient. The table side bananas foster presentation was fun! This was a wonderful experience with Matt, Paul's nephew, who was our server and also took a fun picture with us to try to remind Paul Pointer of our meeting with him, his wife and others in Cocoa Beach a couple years ago. That's when Paul told us about Lemp so we came to see all about it after our trip to Branson. It was a fantastic experience and a big thank you to Matt! I ordered the shrimp and it was hot but he mashed and broccoli were cold not even warm at all. We go every year for the Sunday fried chicken. It's always delicious, including the many side dishes. Food was delicious . Great place for special occasions or romantic dinner for two. We celebrated my mom’s birthday here and it was wonderful! Service, food, ambience, all was fabulous. Mom grew up near the Lemp and it was the first time she had ever been inside. She really enjoyed the museum and looking around this historic building. Plus, they brought her a delicious red velvet cake/cheesecake with a candle. She felt loved! We shared a wonderful lunch with good friends and great food. Service was impeccable. We weren't aware that Sunday didn't have standard menu. The family style Fried Chicken dinner was good, but not the higher class style dinner we expected. We had rescheduled from the previous week when we were going to dinner for Valentines day. Biggest disappointment was they served too much for us to eat, but we couldn't take left overs home, meaning they would just get thrown away. I hate to waste food like that. green beans mushy, Rolls just ok. Other food-ok. It was very cold sitting next to door and old windows, even though there was a radiator and portable heater next to us. I myself probably won't be back. Visited for the first time and must say that i will definitely return and recommend that my friends try it out as well. Really good food and friendly service. I love going to the Lemp. It never disappoints. Excellent service, ambiance, food, and drinks. We had the Valentines Special. A really nice evening. Went for our Valentine’s Day dinner on Friday night (day after). We were seated near their comedy which was extremely loud and not conducive to a romantic night out. Special of the night was Steak Manhattan, it was very mediocre. Service was sub par, could see the server just sitting by the bar, which was nice after not having my drink until I was halfway through my meal. Unlikely that we will be back, glad we got to see what the mansion looked like, though. Food is worth every penny. Staff is amazing and very friendly. Will be back. Always a great experience at Lemp. I thought the food & architecture was amazing. But the behavior of the waiter and workers was a bit offensive. My first time there so I had no idea where anything was. I waited till I finished majority of my meal before asking the waiter if he could tell me where the bathroom was. Instead of telling me, he escorted me to it. The bathroom was amazing! So after finishing my business, I waited until other guest left to take a few pics. My company was still seated at the table. Our food nor drink were empty. I return to table and my entire table had been cleared! My friend informed them were weren't finished. They cleared the table anyway. Upon asking for my ticket, I informed the waiter I had a groupon. He blurted loudly for everyone to hear my personal business. " She has a groupon for $30 on a Sunday! " Not understanding what the big deal was and why he felt the need to make my payment business public, I asked him what was the problem. He explained to me that the groupon I had was not accepted on Sundays. Before I could even offer to pay for our meal in full, he took my code and passed redeemed on my app. I was not only embarrassed by his actions, I was utterly offended. As beautiful as the place was and as good as the food is, I'll never return. Not even for a tour and I love relic places. The Lemp continues to be a fun-filled atmosphere. I took our two teenage daughters to dinner there last Saturday night. James, our server, was outstanding and did his best to engage my less than social 14 year-old. He had excellent suggestions, knew a lot about the property and even the history of some of our food choices. When you visit, ask to be seated in his section! I selected the eggplant parm while my daughter chose the chicken parm. Both were perfectly done. I especially liked the bit of crisp on each piece of eggplant. My daughter commented on the sauce being the best she's ever had. Daughter #2 selected the Steak Diane and it disappeared within minutes. There were what I am guessing was one of the mystery dinner events as well as a second activity going on in two of the other dining rooms. Those activities were loud but entertaining from what we could hear and did not bother us. We will try to attend one of them in the future. Everyone was having such a good time. All in all, it was a very nice evening. The staff was very attentive and my daughter was very interested in the house and its history. We were even allowed to peek upstairs! Great atmosphere! The history and of course the ghost lore were great topics of conversation among us. The food was very good. I had anticipated the restaurant location to be the Main Event and the food to be a side show . However, the food was quite good and the menu selections were very interesting. The chicken parmesan was very tasty. I was impressed. Also, the bread was tasty and warm. Steaks were over cooked waiter didn’t care service was not good, Ordered the $17 Bananas Foster for two the lack luster manner in which it was prepared resulted in stringy banana pieces and melted ice cream. This guy needed to at least try, which he did not. I will not be going back. Food was very good service was great perfect place for a date! Excellent choice for a quiet date night and fabulous dinner! Wouldn’t change a thing, will definitely be going back!